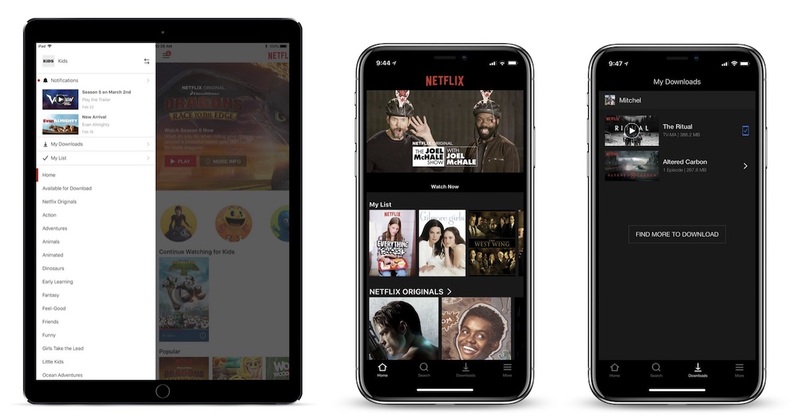 Over the past few days there have been multiple reports of a new update to the Netflix app on iOS and Android devices, which includes a design overhaul for the streaming service's navigation bar on smartphones. Instead of placing every piece of navigation within the top lefthand corner "hamburger" menu, Netflix has introduced a simpler tab bar at the bottom of the app with four tabs for Home, Search, Downloads, and More. Previously, the left-handed menu housed profile switching, notifications, downloads, My List, and various themed categories. Now, these options are mostly located in the "More" tab, and Netflix has broken out Search and Downloads as a quicker method of jumping into those areas of the app. TV and film categories are also now located in the Search tab, including those Available for Download, Netflix Originals, Action, Dramas, Horror, and more. On Android, it appears that there will be an additional tab for users called "Coming Soon," displaying TV shows and movies launching soon on Netflix. Apple encourages developers to use tab bars at the bottom of their apps in its Human Interface Guidelines, since they're easier to use one-handed and provide more information at a glance. Two years ago Spotify made a similar change, replacing its hamburger menu with five tabs for Home, Browse, Search, Radio, and Your Library, akin to Apple Music's tabs on iOS. Earlier this month, Google Maps added a bottom tab bar in its iOS app as well, so users could easily jump to Explore, Driving, or Transit information. Netflix's rollout plan for the new tab bar remains unclear, with some iPhone and iPad users already seeing the update and others remaining on the older hamburger menu style. Netflix ... just please do NOT screw up the AppleTV UI like Google did with their YouTube app. Please I'm begging you!! Netflix's AppleTV app wastes massive amounts of space. You can literally only see one row at a time. Youtube's app isn't great but at least they don't devote 2/3 of the screen to a jpeg image. Can they make the Apple TV app easier to navigate now? I'd prefer the clean UI and non gigantic jpeg images for previews. Also I heavily prefer ATV's 10 second previous/advance swipe+hold option on the remote as well as their scrubbing method vs ATV_YouTube app. I know this goes against all of today's design, but simply adding a settings option that lets us choose between a couple of UI's would be the greatest thing to ever happen on Apple TV. Hulu's is the absolute worst, I can't even imagine how this crap made it past QA. Netflix’s Apple TV UI is 100% pure *******. Love ‘me for the video content, but their software warrants war crime prosecutions. Worst use of space, horribly sized content thumbnails, obnoxious new auto-audio when browsing adds new lows in overall piss poor user experience, which already includes perhaps the worst content browsing of any modern media platform. And the cherry on Netflix’s software failure is the absolutely stupid profile select screen you’re forced to click thru every time you select the app, even if your home is using only one profile. Care to provide some suggestions for improvements? I feel the UI their using is pretty much standard: Tubi, Twitter is the same for scrubbing, Tubi the same for icon layout of videos, no auto preview. I don't like how auto previews have some Netflix custom audio that doesn't match with the video (Tron Classic) and is repeated for other movies. #1: get rid of auto-play. It's an abomination. No app should just start randomly playing crap if you leave it sitting alone for a moment. It’s a welcome improvement, but still not enough to make it a great app. Why didn’t they add ‘My List’ to the tab bar as well? To me that item is more important than the download section. The app also still kicks you out of the app when you attempt to access the account settings. I personally also still hate the horizontal scrolling. I’d rather have vertical scrolling only (you can do this on the web version). Apple was way ahead with this "tab bar at the bottom" navigation. It's always been superior to the hamburger slide out or top tab bars (which seems like a hangover from the desktop). One previous issue was that the original 3.5 screen was so small that any extra UI chrome would eat into that screen estate. Still, bottom tab bar navigation has always been the better option. There was a time where the user was able to change the items appearing inside the tab bar, like in the Music app of iOS 5 if I remember correctly.